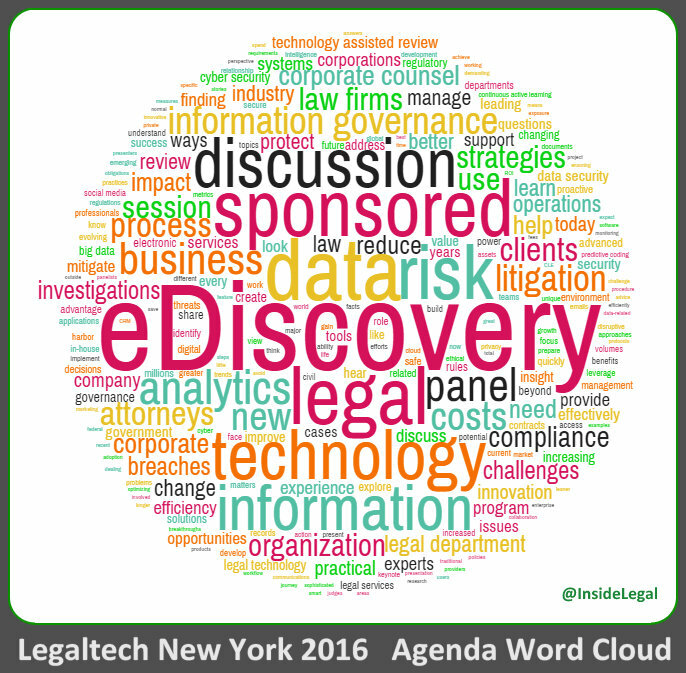 In a couple of weeks, a few thousand people will convene at Legaltech New York (LTNY) for 3 days of exhibitions, networking and legal technology sessions. 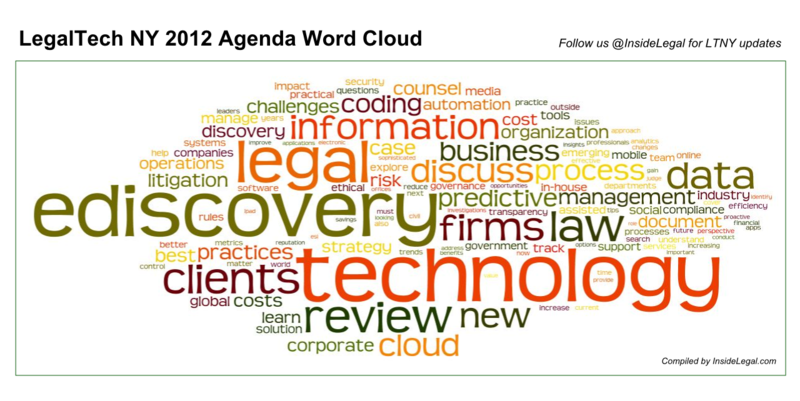 To give an overview of what will be covered in those sessions, we have again created the LTNY agenda word cloud, visually displaying the words/themes included in the event's agenda of sessions. 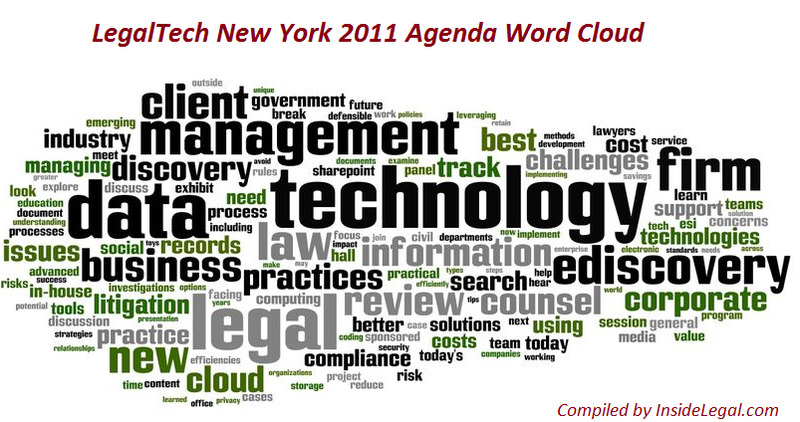 The word cloud was pulled from the agenda located at www.LegalTechShow.com minus speakers' information and includes words mentioned 4+ times. Law firm marketing, in 2015, is a whole different ball of wax—especially compared to what it was, even five years ago. Before web-based marketing mastered the public consciousness, lawyers could 'hang shingles' and expect client traffic to commence; law firms could place advertisements in paper publications, without ever reconsidering self-publication alternatives; attorneys viewed websites as luxuries. The rise of the internet, most especially social media, has led to a sea change in the way in which professionals market their services. Traditional advertisements have morphed into two-way conversations; engagement is the new touchstone. Law firms no longer need to uncover publication sources, when blogs have become a standard medium in legal, and where the reach of those blogs can be expanded through leveraging social media accounts. The revised shop front is an effective website, buttressed by a robust, continually expanding social presence. Time was, lawyers could count their marketing efforts on one hand; but, modern law firm marketing is a Hydra. The question is how to master the beast, and convert it into an efficient selling machine. If you are attending the conference (or not), you are also invited to join the Boston Solo/Small Firm Legal Meetup later that night hosted by Lisa Solomon and Carolyn Elefant. This event will serve as the ‘official’ conference wrap party, but it’s also open to any solo and small firm lawyers in and around Boston — regularly, or on that night in particular. The fun starts at 5:30 at Scholars on School Street. If you aren't able to attend in person, you can follow the conversation through its hashtag #LHLM, through @InsideLegal or through LOMAP's social media guru @JaredCorreia. Provide an overview of big data and share tips and best practices for planning and executing a big data project including where to start and who to involve. Have attendees gain a deeper understanding of big data’s current and future role in the legal profession, and learn about specific legal big data scenarios that will broaden this understanding – and perhaps even inspire projects of their own. We really enjoyed our first visit to the AALL Conference and would like to thank our fabulous panel for their time and assistance in developing the program as well as ILTA/TJ for her assistance and work coordinating all the education as part of the technology/ILTA track. For more Big Data information, visit InsideLegal's Big Data Resource Page.